Paul Boltwood was born in 1943 at Vancouver, British Columbia. He obtained his bachelor’s degree in mathematics in 1966 from the University of British Columbia in Victoria, and went on to occupy various jobs before becoming President of his own company, Boltwood Systems Corporation, in 1980. He became interested in astronomy around 1955 and constructed his first telescope around 1958. 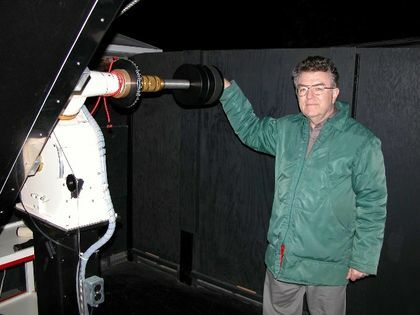 In 1989, Boltwood decided to construct his own observatory, to design his own CCD camera, and to develop software for taking high-precision images of the deep sky (CCD cameras and programs were not available on the amateur market at the time). After training himself in many techniques, he had completed everything by 1992. In 1993, he constructed his first telescope with the intent of selling it. Boltwood also began his own survey of blazars OJ 287 and 3C 66A. Blazars are galaxies that are tilted such that the jets of radiation emanating from their core are aimed straight at Earth. The observations and data that he gathered with his amateur equipment were of such good quality that he was able to collaborate with professional astronomers. In 1997, Boltwood produced fantastic footage of the Hyakutake comet nucleus using his own equipment. An even greater accomplishment was yet to follow in 1998 when he participated in a contest organized by Sky & Telescope for the best image of the deep sky using amateur equipment. The idea of the contest was to see just how far amateur astronomers could “see” with their equipment. Not only did Boltwood win the contest, he astonished astronomers with his entry. Boltwood was deemed to have taken the best image of the deep sky ever obtained using amateur equipment. Using his 40-centimetre telescope (that he built himself), his CCD camera, an exposure time of 20 hours in his backyard near Ottawa, and digital processing of the image using software that he developed, Boltwood attained a magnitude of 24.1, even better than the Mount Palomar telescope! He even managed to improve the image later to a magnitude of 24.5. Needless to say, he won the contest. Boltwood received the Observer of the Year Award from the Ottawa Centre of the Royal Astronomical Society of Canada in 1991 and 1994, the Chant Medal from the Royal Astronomical Society of Canada in 1995, first prize for the Sky & Telescope Deep-Field Challenge in 1999, the Amateur Achievement Award from the Astronomical Society of the Pacific in 2000, and the Ken Chilton Award from the Royal Astronomical Society of Canada in 2003. Asteroid 8785 is named in his honour. Boltwood is currently pursuing his collaboration with professional astronomers in the study of several blazars.